Twins starting catcher Jason Castro went on the DL May 5th with pain in his right knee. Initially, it was reported that Castro underwent a cortisone injection and was hopeful to return to the lineup soon. Unfortunately, after traveling to Vail, CO to see noted orthopedic surgeon Dr. Robert LaPrade, Castro is now scheduled to undergo surgery May 15th to address a meniscus tear. (Update: Now being reported that he underwent more extensive surgery including a meniscus repair and is now out for the season). This will be the third surgery for Castro’s troublesome right knee, according to the Pioneer Press. He sustained an ACL tear along with a meniscus tear in spring training 2011 and underwent surgery, which caused him to miss the entire season. He also underwent arthroscopic surgery on the same knee in September 2013. Question 1: What is the meniscus? What is its function? The meniscus is a C-shaped cartilage cushion that is positioned between the bones of the knee (the femur and tibia). It has several functions including acting as a shock absorber, a protector of the surface cartilage and a stabilizer of the knee. 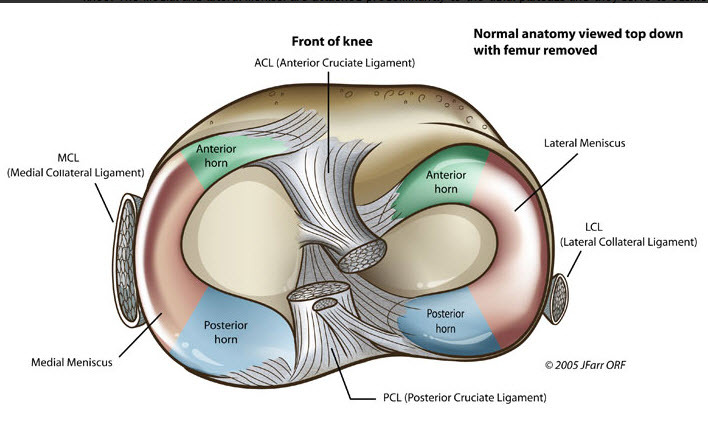 There are two menisci in each knee- a medial and lateral meniscus. The medial is positioned at the inside of the knee, the lateral to the outside. Both the medial and lateral meniscus increase the surface area of bone contact within the knee when walking/running, thereby spreading out the contact forces over a larger area. 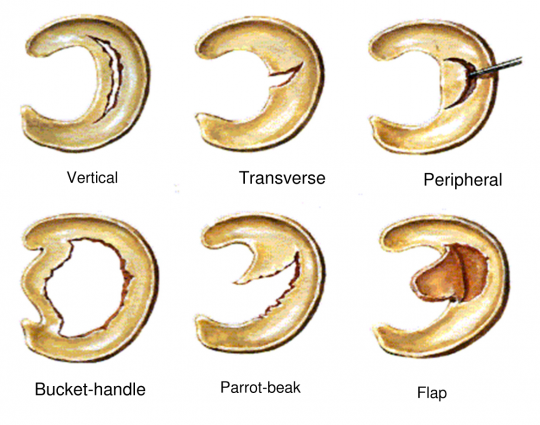 This function protects the surface gliding cartilage (called articular cartilage) from being damaged. Question 2: How is a meniscus torn/damaged? A meniscus can be torn in several ways, but most commonly it is damaged when the knee undergoes an abrupt change of direction and the stress is more than the meniscus can withstand. In the case of Castro, it sounds as though he had some damage to his meniscus in 2011 when he also tore his ACL. A meniscus tear accompanies an ACL tear about 50% of the time. Either the medial or lateral meniscus can be torn, and in some cases both sustain injury. Question 3: How are meniscus tears assessed? Most commonly an MRI is ordered to look at the meniscus more closely. The meniscus can’t be seen on xrays. There is a device that is similar to a large needle that has a camera inside it that can be inserted into the knee during an office visit to view the meniscus directly, but I don’t have much experience with this device. Question 4: What types of tears can occur? There are a number of different types of meniscus tears, and there are many tears which don’t fit neatly into a single category as well. Question 5: What are the treatment options for meniscus tears? 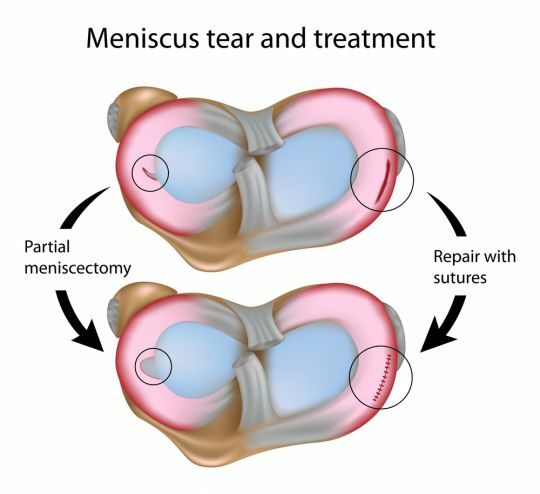 There are a number of different options for treatment of meniscus tears. Not every meniscus tear will require surgery- in fact, many people may have a meniscus tear in their knee and not even be aware of it. Anti-inflammatory medication, injections (including cortisone, gel/lubricant, and PRP injections), and physical therapy are among the non-surgical options. When these are not successful (or surgery is deemed necessary early on), knee arthroscopy is performed. During knee arthroscopy, the knee is inflated with fluid and a camera is inserted inside the joint. The structures of the knee can be readily assessed, and tools are used to examine and probe the meniscus, surface cartilage and ligaments. The specifics of the meniscus tear are then evaluated. A decision is then made whether to repair the meniscus or remove the torn portion of meniscus (called a partial meniscectomy). This decision can be complex and is based on a number of factors including the size, location and orientation of the tear, patient-specific factors such as age, weight, health, prior surgery to the knee and others. Ideally, we would repair all meniscus tears, as removing meniscus can lead to the development of arthritis later on. However, some tears are simply unable to be repaired and must be partially removed. Tears closer to the outer edge of the meniscus have better blood supply are more likely to heal, and thus are better suited to repair. Question 6: What is the recovery time? This can vary significantly, but for partial removal, most athletes can return to sports between 6-10 weeks after surgery. For repair, the recovery is longer because of the additional time required for the repaired tissue to heal. Typically, a return to sports for a meniscus repair is around 3-5 months. Question 7: Are there any special circumstances with Castro’s knee? I would say yes. The fact that he has had two prior surgeries on the knee (including an ACL reconstruction) often makes the MRI more challenging to interpret and can complicate decision-making. It is unclear to me if the current meniscus damage is in the same area where he previously had surgery, which can create an already abnormal appearance on MRI. Thus, it is difficult to know whether what appears abnormal on a current MRI is ‘new’ or ‘old’. However, it sounds like he has continued to have intermittent problems over a lengthy amount of time now, and it seems reasonable to go ahead with arthroscopy. One concern is that a tear can enlarge in size over time if left alone (though this is difficult to predict). Dr. LaPrade is a world’s authority on knee problems and I’m sure he will do his best to get Castro back to action quickly and safely. Thank you for these articles.Well-informed, expert perspective is welcome reading.I won't look forward to the next one, but I'll look for it when the inevitable happens. Thank you, doctor. Facts are our friends.